Home / Celebrities / Celebrities & Fitness Trainers / POP Pilates Creator Cassey Ho Talks About Fitness & Loving Your Imperfections! POP Pilates Creator Cassey Ho Talks About Fitness & Loving Your Imperfections! Cassey Ho is an award-winning fitness instructor, entrepreneur and personality based in Los Angeles, CA. She is the creator of Blogilates, the #1 female fitness channel on YouTube with over 300 million video views and 3 million subscribers. As a certified group fitness instructor and Pilates mat and Reformer teacher (ACE, NESTA, Balanced Body), Cassey has been motivating people to move for nearly a decade. The magic all began when Cassey started breaking the rules. Fusing pop music together with her classical Pilates routines, the way Cassey melded the music to the mat was unlike anything the industry had seen before. Students began to crave her innovative choreography because it brought the fun back into working out! She decided to call it POP Pilates®. When Cassey posted her first POP Pilates® workout video on YouTube back in 2009, it was intended only for her 40 students to see. In fact, the only reason why the video was created was because Cassey was moving cross-country and she wanted to leave a farewell workout video for her class to do anytime they missed her. Little did she know that this genuine intention to serve her students would end up being the first building block of what would eventually become the infectiously inspiring world of Blogilates. Today, POP Pilates® is now a live class and internationally recognized instructor certification program (ACE, AFAA, NASM). In a groundbreaking partnership, 24 Hour Fitness aligned with Cassey to make POP Pilates® the official Pilates format of all their gyms in the United States. 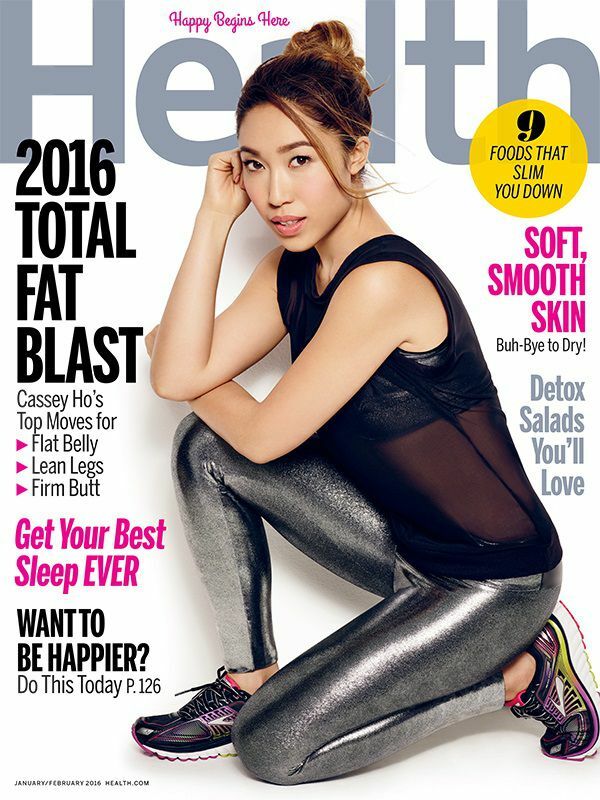 From authoring her best-selling book, Hot Body Year Round to designing and manufacturing her own performance activewear line, POPFLEX – Cassey is continually evolving the world of Blogilates to help bring more value and happiness into the lives of her community members, aka “POPsters”. In 2016, Cassey launched her toughest body transformation program, PIIT28: an equipment-free Pilates Intense Interval Training workout that takes only 28 min and 40 sec a day. The results, mental and physical, are absolutely phenomenal. Cassey has been featured on numerous media outlets such as Good Morning America, Dr. Oz, The Steve Harvey Show, PEOPLE Magazine, COSMPOLITAN, SEVENTEEN, The New York Times and she recently graced the cover of HEALTH Magazine! Let us take you through Cassey Ho’s incredible fitness journey in an exclusive interview with Namita Nayyar, President Women Fitness. Ms. Namita Nayyar: You are an award-winning fitness instructor, entrepreneur and personality. You reached the pinnacle of success when Blogilates became the #1 female fitness channel on YouTube with over 300 million video views and 3 million subscribers. Walk us through your incredible fitness journey. Ms. Cassey Ho: It all started when I was moving from Los Angeles to the East Coast to pursue my dream of being part of the fashion world. But before I left, I made a farewell Pilates video for my students at the time. I hated leaving them, so I thought I would film a total-body Pilates video and upload it on YouTube so we could still workout together! As I started my corporate job in the fashion world, I hated it. I was surrounded by toxic negative energy. Every day my soul was breaking and I knew I wasn’t meant to be there. The only thing that kept me going was looking forward to teaching my Pilates classes at local clubs. Then a miracle happened. My sister texted me and told me that one of my Yoga Bags was in Shape Magazine. That was it. I quit my job, bought a ticket to China to look for a manufacturing company. When I got back, this was when my YouTube videos really started to take off. I started putting more effort into them. More and more comments rolled in and it motivated me to make better quality videos and to listen to what people really wanted. That is how the Blogilates YouTube channel became the number 1 most subscribed female fitness channel with now over 3 million subscribers.